Berkeley Life Nitric Oxide Test is designed to be the most convenient, affordable, and accurate at-home NO test available. 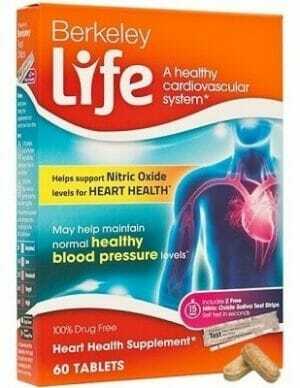 An important tool for those who are attempting to regulate healthy blood pressure levels and overall heart health. Purchasing this product today earns you 10 DR Reward Points! Few measurements are more directly correlated to heart health than nitric oxide levels. Without nitric oxide, the body will struggle to regulate healthy blood pressure within a natural range. Those who are concerned about their heart health and the diminishing of nitric oxide production that comes with advanced age may want to strongly consider testing for a deficiency. 10 ultra convenient test strips. Fast and highly accurate measurement of nitric oxide levels. Simply apply to tongue and compare to provided NO scale. If measurements are below optimal, then try our Heart Health Supplement for nutritional support of healthy nitric oxide levels. Nitric Oxide (NO) is a chemical produced in nerve cells which facilitates the transmission of nerve impulses throughout the body. Without an adequate supply of NO, the body is faced with a number of health complications, the key among them being an increased difficulty in regulating healthy blood pressure levels. The reason for this is that NO helps signal to arteries when to dilate and increase blood flow in certain areas of the body. While NO is organically produced in the body on a molecular level, difficulties with production tend to arise, particularly in those of older ages. This is because free radicals which accumulate through extended exposure to toxins and heavy metals create damage and imbalance in vascular cells and others which produce and rely up NO. For those who are experiencing cardiovascular health complications or those who are progressing into an advanced age and wish to prevent such difficulties, testing for NO levels is critically important. Place test strip with the ‘saliva here’ side on your tongue. Fold the strip over and gently press the two sides together. Separate two sides and compare color on test pad to the NO scale. Note: Test before and two hours after your nitrate high meal or supplements. Ensure you have not consumed anything 10 minutes prior to testing.